Ajvar (pronounced as ay-var) can be considered as the “Serbian Vegetable Caviar” and is a must-try for all the foodies out there. It is made of roasted red bell peppers and sometimes combined with eggplants. Mostly prepared in the middle of autumn where you will see tons (literally… tons and tons) of red peppers and can last until the early days of spring for most people. It’s just so hard not to eat all the home-made ajvar before mid-winter. 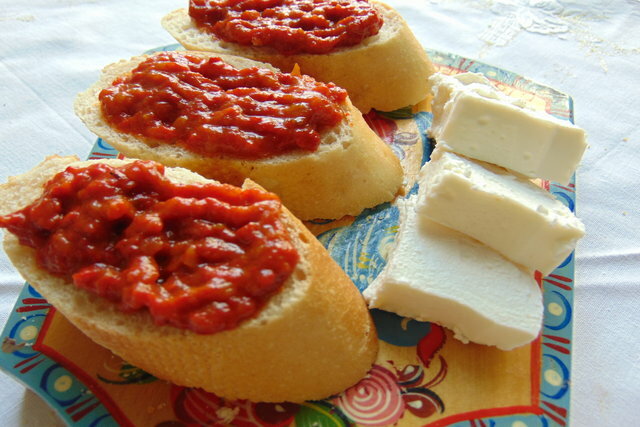 Ajvar is so versatile and it just makes everything in your pantry taste better. It can be enjoyed as a spread, as a dip for potato chips, a side dish to your meat and as I said “everything that comes to your mind”, but let me tell you that if you eat ajvar with some domestic white cheese, then you reached the peak of ajvar goodness. As much as I love homemade ajvar, there are a few brands of ajvar available in our local supermarkets which are just as good. Wherever you are in the world, I would recommend trying this condiment or visit our lovely Serbia.